The historic center of the Hanseatic city Stralsund, which is listed as UNESCO world heritage, offers a cosy atmosphere during the Advent season. With 3 Christmas markets in the heart of the city we would like to get you in the mood for the contemplative festive days. The famous town hall cellar, one of the biggest vaulted cellars in the Baltic region, is the highlight of our Christmas market. Artists, craftspeople and retailers offer high-class Christmas presents and accessory full of atmosphere. With the town hall in range of sight, the Alter Markt is the right address for families and everyone, who likes things a little more cozy and contemplative. Our skating rink, with a size of 450 square meters and decorated with a luminous Christmas star of 6 meters height, will provide a lot of icy fun for everyone. This year we offer a seperate curling lane for all keen team sport fans. School classes and day-care centers can use the skating rink on weekdays from 11:00 to 14:00 free of charge after prior notice. 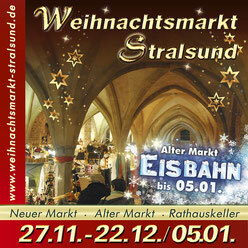 The tradition of Stralsund’s Christmas market also includes the fair on the Neuer Markt. The fun attractions are lighting colorfully and allure with sweet treats like roasted almonds, candy floss and gingerbread hearts next to toss and shooting stands. Unique atmosphere with more than 40 retailers and craftspeople in the gothic vaulted cellars. The biggest vaulted cellar in the Baltic region offers space for more than 40 artists, craftspeople and retailers on circa 1500 square meters. Here one finds individual and passionately manufactured Christmas presents and accessories to give pleasure to our dear ones. Also the youngest citizens of Stralsund are involved in the Christmas market preparations. In the town hall cellar, kids of the local primary schools and kindergartens decorated the Christmas trees with self-made ornaments. Fairy storytelling, consultation hours with Santa Clause, many crafting and join-in actions as well as a Christmassy program on stage with live music, also invite to linger in our cozy town hall cellar with its unique atmosphere.